Jewelry by Melanie Nützel and Nikolay Sardamov, textile art by Roos Soetekouw, and containers by Milan Pekař at Galerie Eva Maisch, Würzburg. Secret gardens are places of longing that have inspired artists in every epoch. The motif of the garden lends wings to our imagination, awakens our yearnings, and transports us out of everyday life into dreamy spheres. This motif recurs in countless fairytales and legends, in poems and stories, on textiles and in pictures – and in the contemporary applied arts. With her “Secret Gardens” exhibition, Eva Maisch reaffirms her sensitivity for imaginative thematic exhibits. 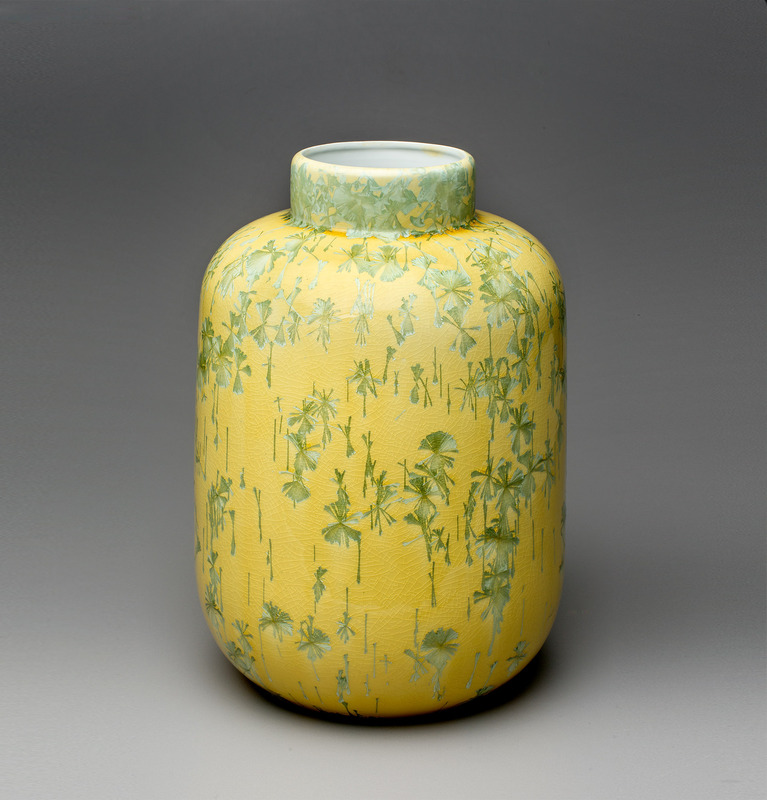 Each show highlights different aspects and techniques of contemporary crafts and design. Visitors can encounter works by renowned artists and designers and can also find creations by international greats whose work is less well known here in Germany. This time, for example, there’s the Czech artist Milan Pekař and his mostly monochrome porcelain containers, which have diverse crystalline glazes that he develops through laborious experimentation. Born in 1980, this ceramist has taught since 2011 at the institute for ceramics and porcelain at the Academy of Fine Arts in Prague. The wonderful textile artworks by Roos Soetekouw from Amsterdam are likewise little known in Germany. This Dutch designer mixes traditional and modern techniques, while always taking pains to preserve the original character of the textiles. Soetekouw sketches and paints to create her designs, but she also uses computer programs. And although she combines widely diverse materials, her goal is always to give visible form to a story that often goes far beyond the theme of the garden. Narratives that can be visually experienced in the artworks also apply to Melanie Nützel and Nikolay Sardamov. This Bulgarian jewelry artist has been interested in the green element in urban environments ever since his “Garden City” project in 2015. As in Baroque gardens, Sardamov subjects motifs borrowed from nature to a rigorous human design and creates new abstract realities. Beetles, for example, form part of a series and become fantastic ornaments. Nature is always present as a source of inspiration and as a motif for Melanie Nützel. But this jewelry artist, who won the Grassi Prize in 2016, recently confided to us that her “Beetle” and “Moth” are probably more likely thematic alibis for her tentative progress in the handling of diverse materials and shapes. For Melanie Nützel, as well as for Roos Soetekouw, Milan Pekař and Nikolay Sardamov, a first glance at their artworks is impressive, but certain mysteries still remain hidden – just as in a beautiful garden. The four artists will be present at the exhibit’s opening from 4 p.m. to 9 p.m. on Friday, June 23, 2017 and again from 10 a.m. to 6 p.m. on Saturday, June 24. New stories about and works by contemporary players of the applied art in our current print edition.